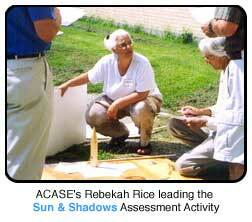 ACASE workshops are tailored specifically to the needs of your district, school, and your teachers. Ranging in time from half a day to two weeks in length, we provide continuing support over the school year as needed or desired. Many teachers from previous workshops have gone forward with the work they began with us—some of this work can be seen in refinements to assessments posted on this website, other work will be incorporated after further testing by other teachers. My work with Paul has given me more focus on how students learn and how to better adapt instruction to those needs. I learned more about the purpose and function of assessment. This work inspires me to make revisions to my assessment and teaching in the classroom. Learning is important to me. Thinking about the various aspects of assessment that get at concepts has been important to me. It is amazing to me that one performance assessment activity can test so many concepts. This work has affected my teaching in thoughtful and positive ways: I want to add more “play” and “discovery” time into units, thoughtfully embed more time and strategies into my instruction in those areas where conceptual understanding is lacking, and include more assessments in my classroom in the future. Pre and post testing, as well as treatments prior to post testing, satisfies a need I have to use information to assess my teaching and students learning. My work with AIS causes me to rethink my teaching, and for this I am grateful. The practitioners meetings with interesting people who have powerful ideas about teaching, learning, and how to assess them has been great! I love being surrounded by thoughtful people who force me to think. I didn’t expect it to be so pedagogically authentic, to actually create a learning environment, to see in real time what a constructivist environment could look like. I was just waiting and then there it was—seamless. I didn’t think the collaboration would be so organic, so on-going. I’m learning, there’s more I want to learn. Initially, I was invited to a demonstration by Paul Zachos at The Adirondack School. The task that I observed was the pendulum observation task. The entire time I was in the room I couldn’t stop thinking about the pendulum and its inner workings. To find out later that the task was primarily aimed at measuring human error was fascinating. I was hooked from that point on and couldn’t wait to start using the tasks with others. I learned to use the assessment as a teaching tool. To have students internalize the assessment procedure is to make a permanent change in how they regulate their own responses. Our work together has given me the opportunity to reflect on my teaching practices and question to what extent, in quantitative terms, my practices truly are inquiry versus deductive reasoning with a set of given knowledge parameters. Our work together has opened my eyes to the use of performance assessments on a regular basis in the classroom. I have benefited from the feedback I have gotten in our collaborative setting. The work we have done this year is a perfect model for how professional development should be done—collaborative, long term, and analyzing student work. Assessment plays a powerful role in the learning process. Aligning assessments with learning goals is essential to a successful learning environment. Working with AIS has also helped me to further develop my assessments by defining them in more detail and communicating them more clearly. The impact of our work has made me a more critical consumer of my learning environments. It’s worth the effort to choose challenging and active learning environments. The development of assessment activities with clearly stated learning goals will continue in my work next year.